Technology has shaped the way in which businesses operate for centuries. Each year, new trends emerge that streamline business operations. In this blog, we’ll focus on some of our favorite wearable tech gadgets that can be used in the workplace. The Huawei Watch is a hybrid smartwatch that supports Android Wear 2.0, Google’s latest update to Android Wear. It’s also one of the first Android Wear watches to pair with iOS 8. High-definition display, solid battery life and Google Now compatibility make it one of the market’s top smartwatches in terms of functionality. Plus, the fact that it’s a hybrid also means it’s pretty sharp-looking. Its full-circle face and scratch-resistant sapphire crystal go well with any outfit, whether it’s business casual or a three-piece suit. The implications of augmented and virtual reality headsets for business are still relatively unknown. What’s for certain, though, is that the Microsoft HoloLens is one of the most incredible wearable tech gadgets you can buy right now. Branded as “mixed reality,” the HoloLens basically allows you to work like Tony Stark in the Iron Man movies. You can project your work directly into your field of vision, allowing you to access every document, spreadsheet, email or anything else you need. It’s kind of like having a PC on your face. Google Cardboard is the lowest-cost virtual reality option out there. It’s exactly what it sounds like—a piece of cardboard—but it’s shaped like VR goggles. You can mount any smartphone that has a built-in gyroscope (here’s a list of phones that do) onto the Google Cardboard viewing device to enjoy a VR experience on a budget. There are about 500 apps available on the Google Play store that are Cardboard-friendly. It’s a good way to develop immersive, educational content for both promotional purposes and employee education, as well as conveniently access your Google account without a computer. Though you don’t wear the August Smart Lock, you do wear the key. The August Smart Lock allows you to create virtual keys for anyone you’d like to grant access to a building protected by the lock. Just hook up a wearable gadget as a key, and you’ll never have to fumble through your pockets to get into your office again. Ringly is a piece of increasingly popular smart jewelry, which refers to stylish pieces of wearable tech that connect you to your smartphone. Ringly is an 18-karat gold ring that comes with a variety of different gemstone options. It maps four different vibrations and five color-changing patterns to alert you to meetings, calls, texts and social media notifications so you know whether or not you have to pick up your phone. 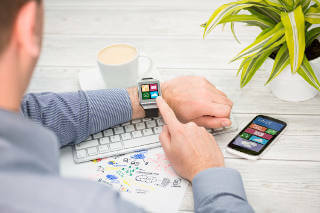 Though it’s still early to predict specifics, there’s a good chance that as more companies roll out wearable tech gadgets, they’ll become even more commonplace in businesses throughout the world. Let us know if we forgot any of your favorite wearables!